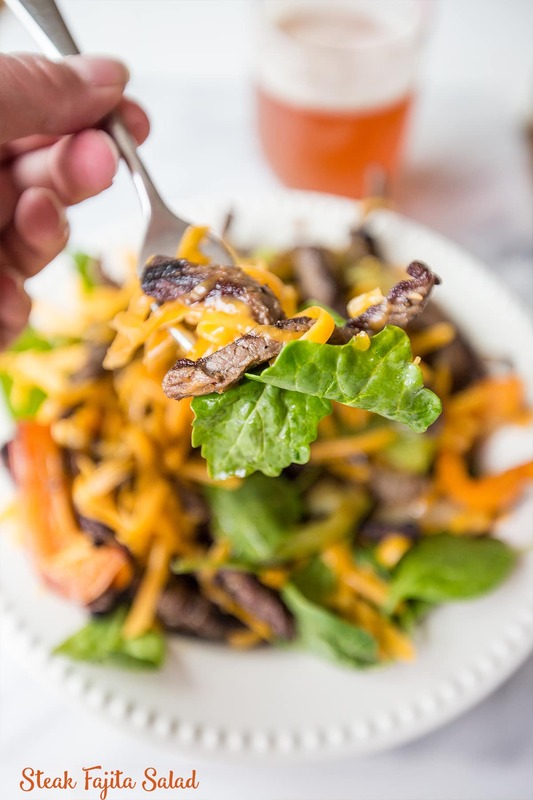 One of my absolute favorite meals in summer are quick and easy fajita dishes- and I have the secret to never fail steak fajitas that taste just like they do in a restaurant! This is a unique technique designed to get your food to quick at super high heat as quickly as possible- so you get that great sizzle and lots of delicious browned bits. The secret to this recipe is an impossibly hot pan, and very very dry steak strips. Give the strips about 30 minutes to come to room temperature on a dish on top of some paper towels- and be sure to blot all excess moisture from the steak before adding to a pan. Pre-season the beef with salt and pepper before hitting the pan. This is a rather smoky way of preparing food- I keep my vent fan on high, and often open my kitchen door to the outside. We’re going for the hottest temperature possible in the pan (which is harder at home than in a restaurant because our ovens don’t go as high) to create delicious caramelized bits of beef and veggies. This browning gives a ton of flavor without adding a lot of extra ingredients- so don’t rush the process! Also- you will need 2 cast iron pans (if you add the veggies and meat in the same pan, you’ll overcrowd it and you wont get a good sear), and you’ll need to be very careful to not burn yourself on them- or by splashing some of the very hot cooking oil out of the pan. This method is really very easy once you’ve done it one or two times and get a good rhythm- don’t let it intimidate you! This will soon become one of your favorite weeknight meals! 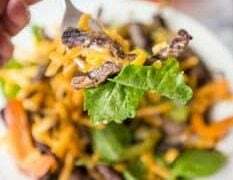 This delicious, easy, fajita salad taste just like restaurant fajitas at home! 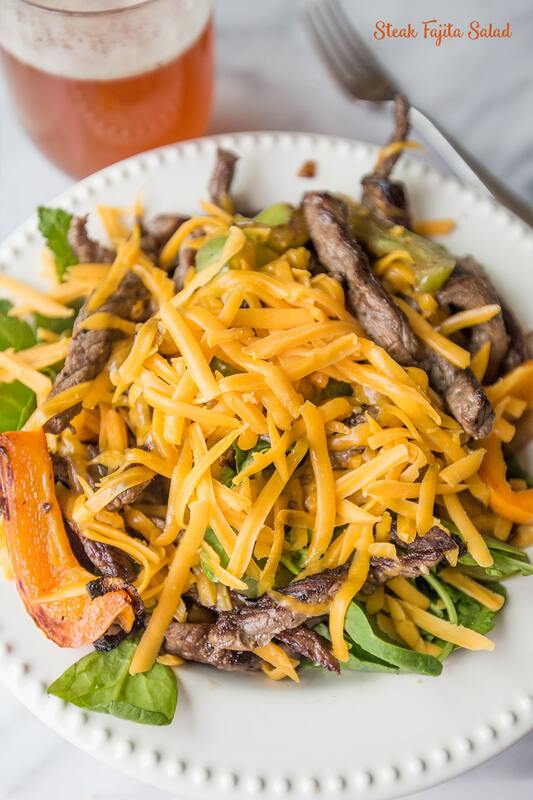 Get perfect steak fajitas every time for a family pleasing meal. Heat 2 cast irons pan in oven at 450 degrees. Prep veggies and meat- let meat come to room temperature and pat it dry with a paper towel. Turn vent fan on high. Turn stove on high, carefully move very hot cast iron pans from oven to stovetop. Add oil to pans, swirl around. Add veggies to other pan. Stir veggies and meat to prevent burning, but let them get a good browning on all sides- about 8 minutes. If using taco/fajita seasoning, add to pan with 2 tbsp water, right before plating. Cook off any extra water. Remove from heat and plate! If you want to create a "sizzle" sound like at a restaurant, splash a little water or a touch of soy sauce and oil in the pan. Plate your salad with lettuce, tomatoes, beans. Layer fajita veggies and meat on top, and sprinkle shredded cheddar cheese over. Dress with salsa, if preferred.